Anyway, I didn’t want to turn this post into a negative thought on this trend (even though I have my doubts). Because there are still typical bowl meals I enjoy very much. And this is also a post about a bowl, right? But the thing is those all have something in common, no matter the style or cuisine. They are healthy, combining ALL the important macronutrients in one meal – good source of protein and fat and reasonable portion of carbohydrates (from vegetables or fruits). 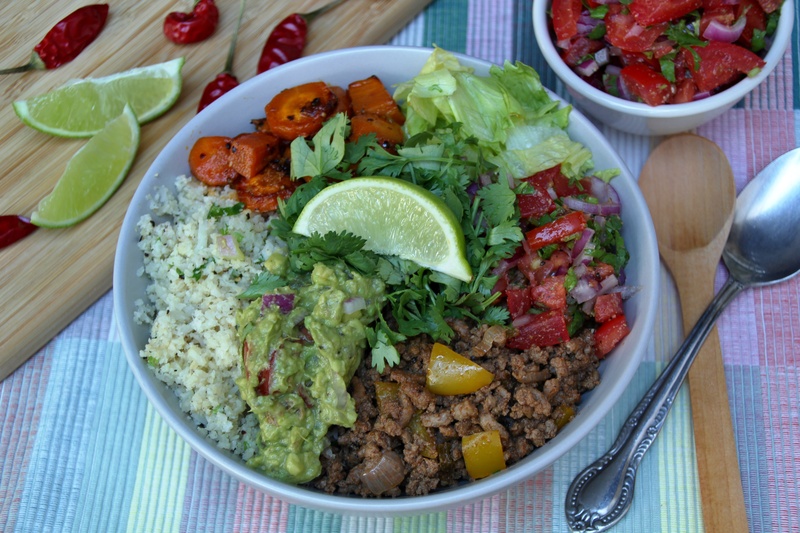 Like this Beef Burrito Bowl (Paleo, Whole30, Low Carb) I’m sharing today. Whoever thought about burrito bowl is my hero. 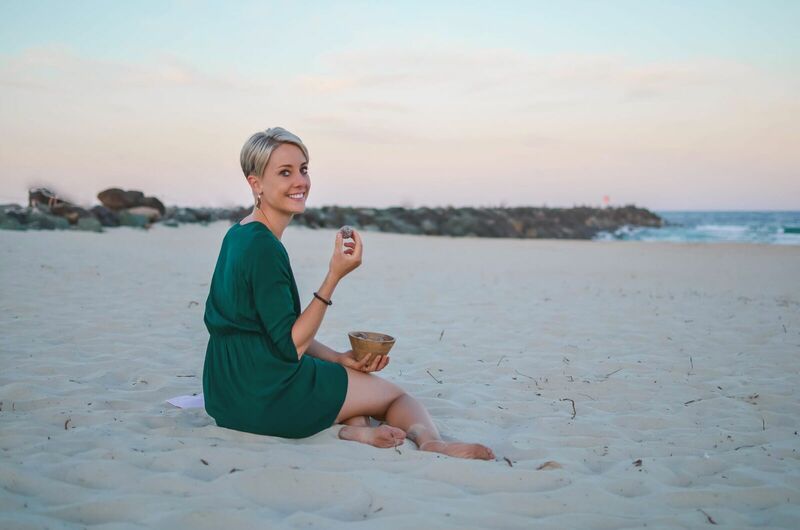 Skipping the needless wrap which gives you only empty calories (and messy hands, T shirts, tables etc.) and concentrating on the good nourishing stuff, so clever, right? And if you wanna make your bowl even healthier, why not to swap the white rice for it’s cauliflower version? Check the easy way how to make cauliflower rice here. Yes, that’s the food in a bowl I think we should see more. Colourful, but also good for you. Let me know if you agree. Ditch the unnecessary wrap full of empty calories and instead enjoy lots of the good stuff. 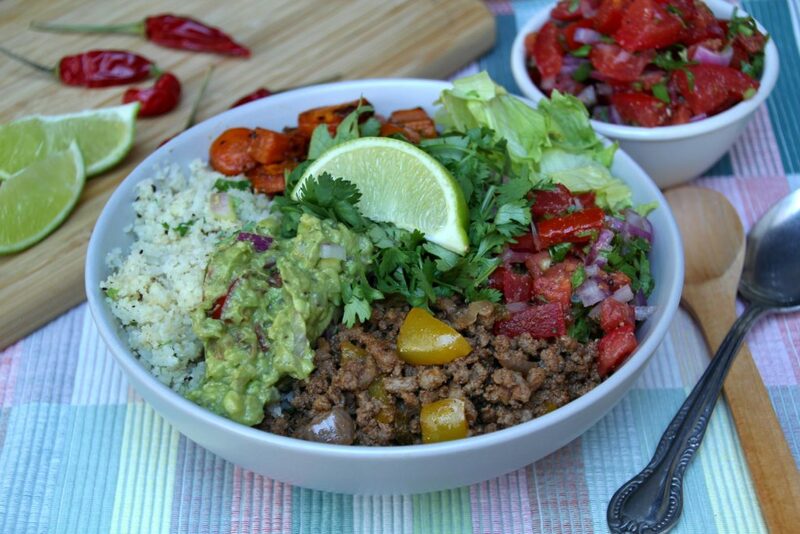 This Beef Burrito Bowl (Paleo, Whole30, Low Carb) presents the perfect combination of spicy and mild, creamy and crispy. Place a pot over over a high heat, pour in 2 tbsp of oil and let it heat. Add the diced onions and brown it a little, stirring occasionally. Then add the beef with garlic and spices and brown the meat, stirring. Once the meat is nearly done add the capsicum and jalapenos (optional) and pour in the tomato sauce. Cook everything for 10 more minutes, stirring occasionally. Mix the tomatoes with all the other ingredients and let the salsa chill in the fridge for at least 30 minutes before serving. Cut the avocado in half and take the seed out. Spoon all the avocado flesh out of the skin in a bowl. Add the lemon juice, pinch of salt and pepper and smash everything to together with a fork. You can leave the texture a bit chunky or smash everything until almost creamy. Add in the tomato and onion and mix everything together. Let the guacamole chill in the fridge for at least 15 minutes before serving. Place a frying pan over high heat and pour in 1 tbsp oil for cooking. Let it heat and then add the cauliflower rice. Fry the rice for 5 minutes, stirring. At the end add the lime juice, coriander, salt and pepper and fry for 1 more minute. Place the carrots and potatoes in a baking dish and sprinkle it with salt, pepper and smoked paprika. Add the garlic and oil/lard and toss the vegetables in the fat equally. Place the baking dish in the oven and roast uncovered for 45 minutes, stirring everything once or twice. Place all the ingredients in a bowl in the preferred amount, add some iceberg lettuce, fresh coriander and a wedge of lime (if you can have dairy than maybe a little bit of sour cream too) and enjoy.